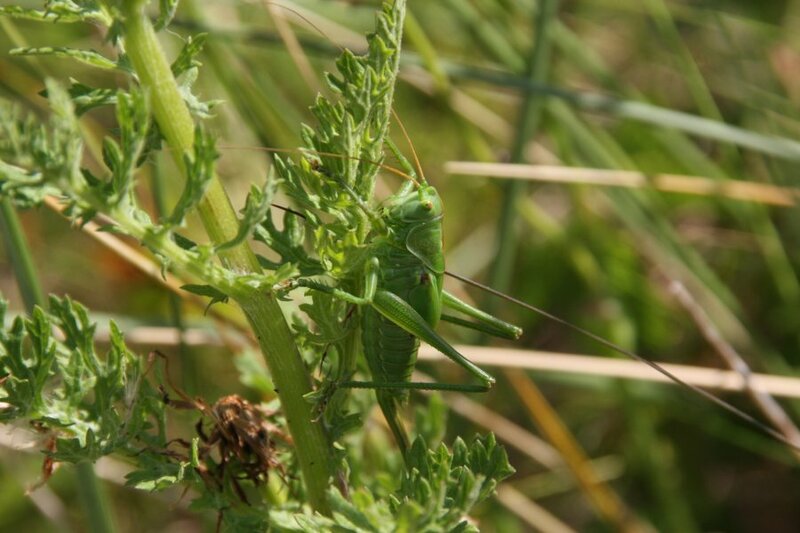 Wild coasts and wildlife on the Gower. 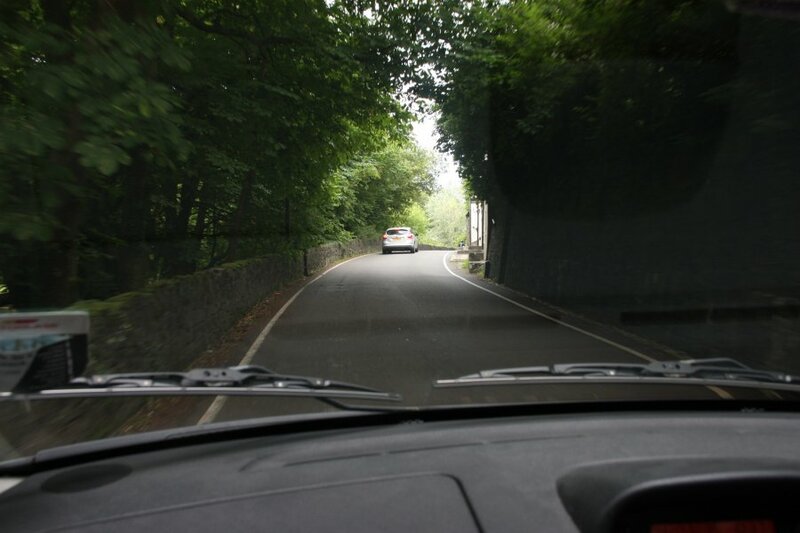 The main road down the Gower peninsula. This is classed as an A road - a major highway. The classifications lose all meaning in places like this. 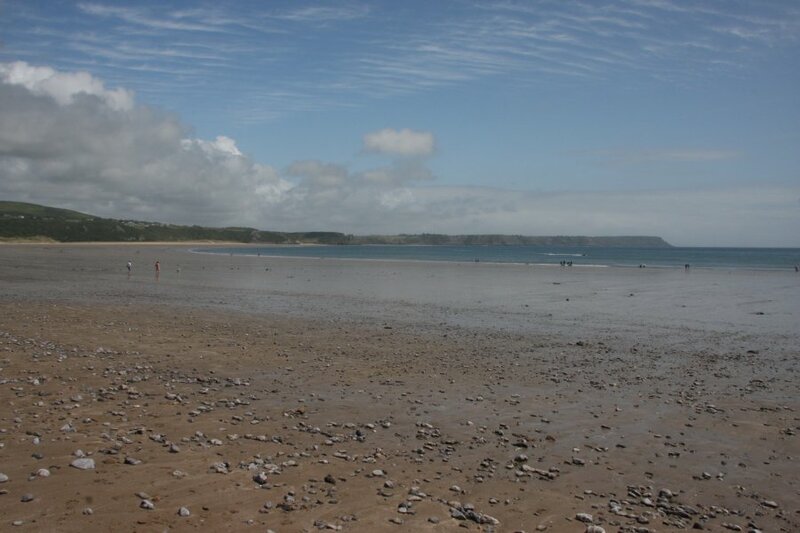 Oxwich Bay, one of the major beaches of Gower, and a very popular destination. Fortunately, the day started very poorly, and the beach remained rather empty, despite the amazing weather that followed. Three Cliffs Bay, the next bay along the coast, and another popular destination. The cliffs on the left are Great Tor while the bare rock outcrop to their right is the Three Cliffs. 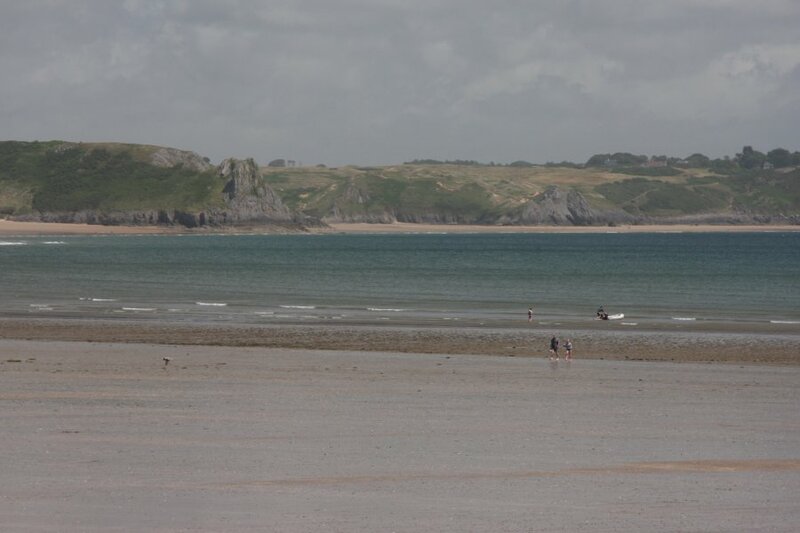 On the right is Pobbles Beach. 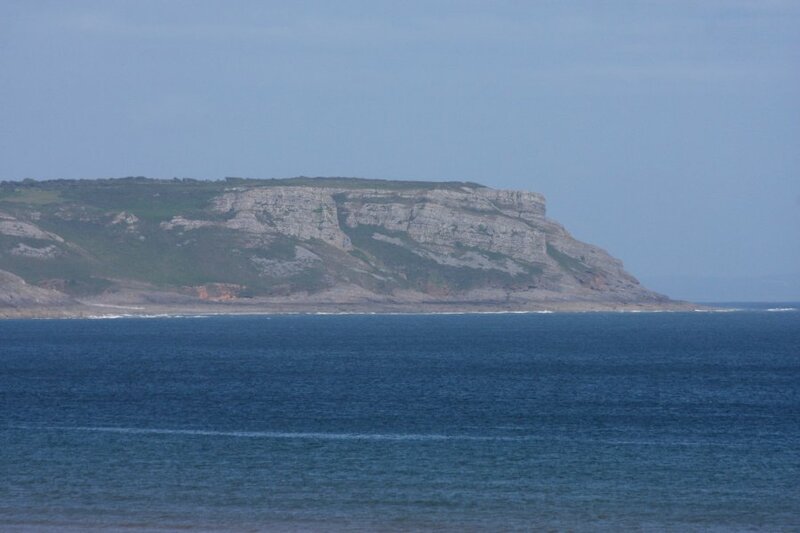 90 metre limestone cliffs of Pwlldu Head. At the left edge of the picture is Bacon Hole, and a little further left is Minchin Hole. 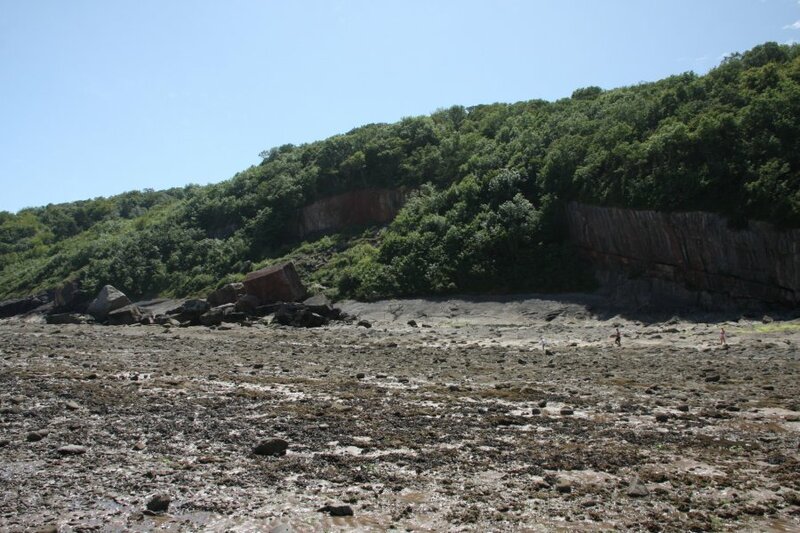 These are two of the major bone caves of the Gower, and contained bones of many prehistoric animals. 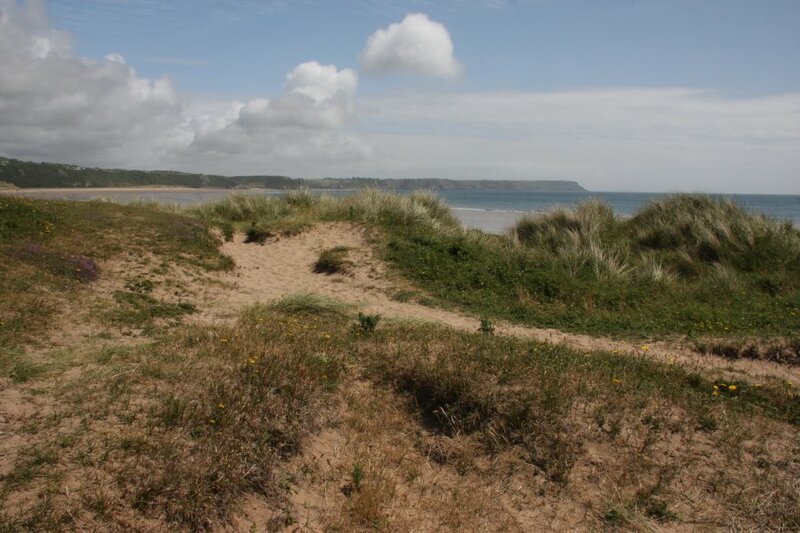 Oxwich Bay is fringed by Oxwich Burrows nature reserve, an extensive set of sand dunes which is home to many beautiful plants, insects and reptiles. 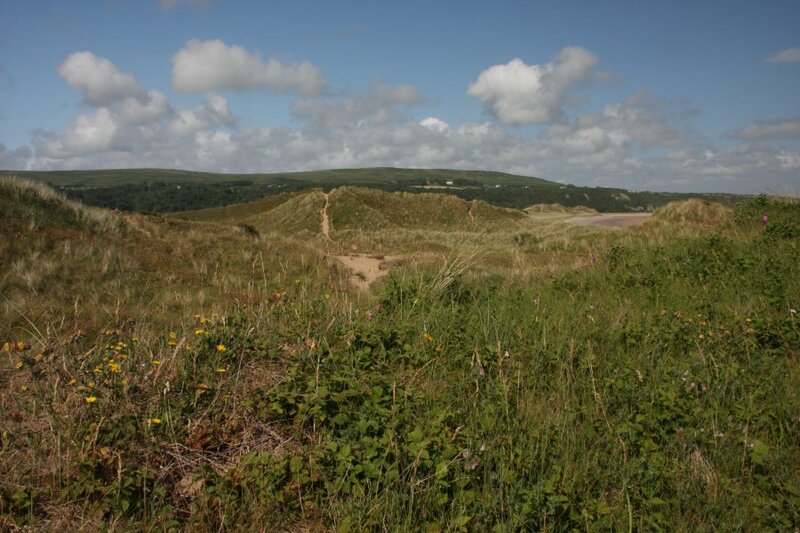 In the background is Cefn Bryn (186 metres). 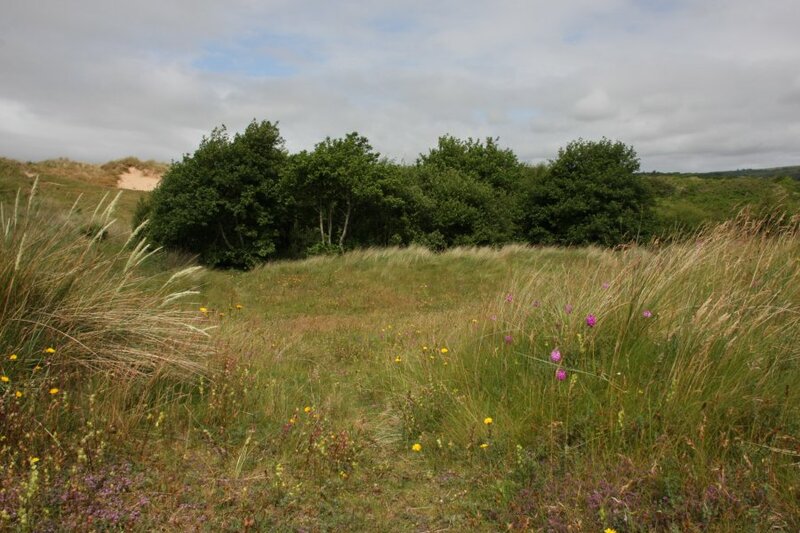 Thicket in an early part of the dunes. 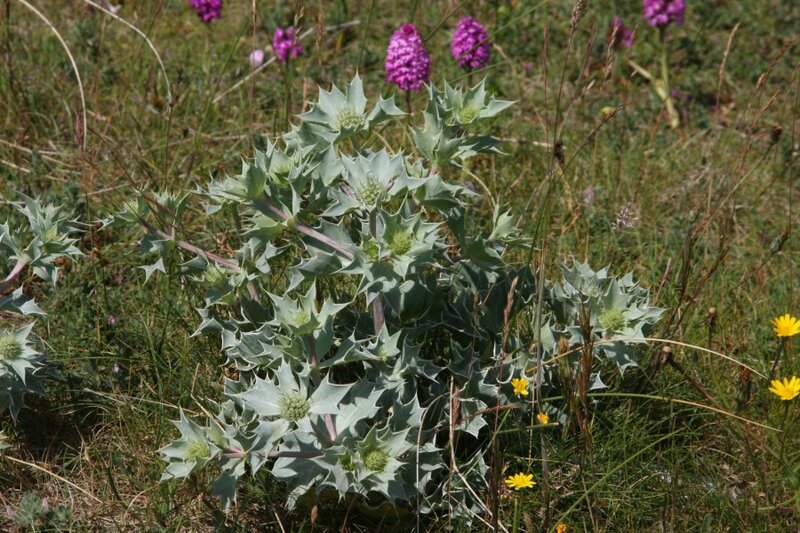 Sea holly, with yellow flowers of hawkbit, and pink pyramidal orchids. 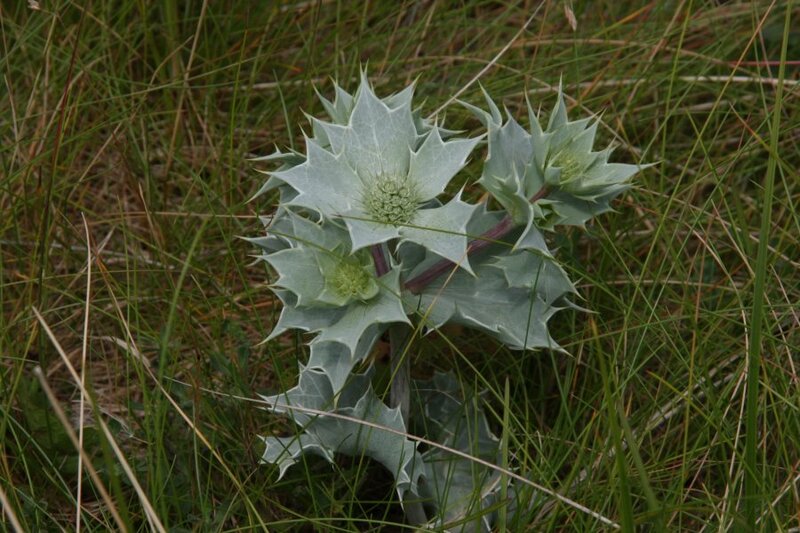 Detail of the sea holly. 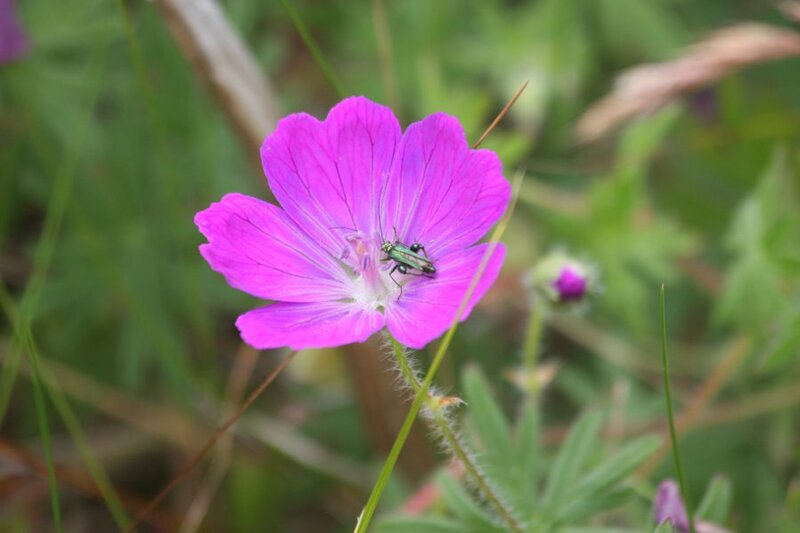 Bloody cranesbill with a male fat-legged beetle. 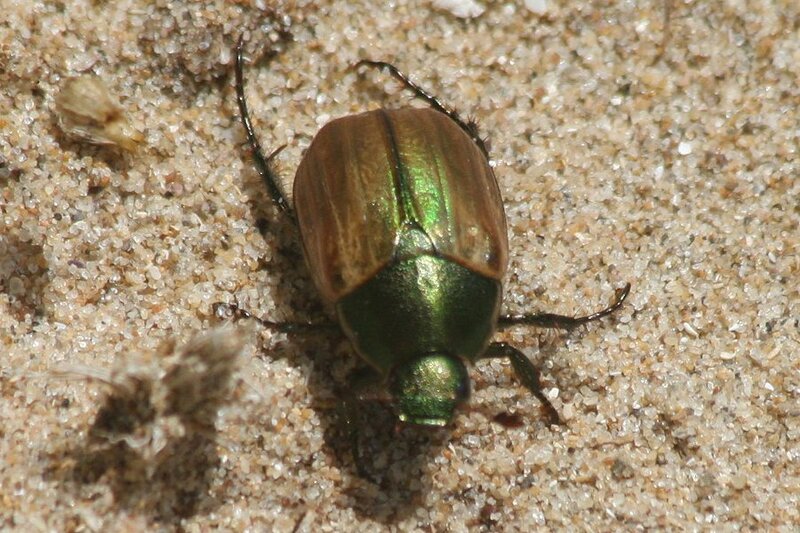 The beatles are also called flower beetles, because they are often seen by accident in pictures of flowers like this, feeding on pollen. 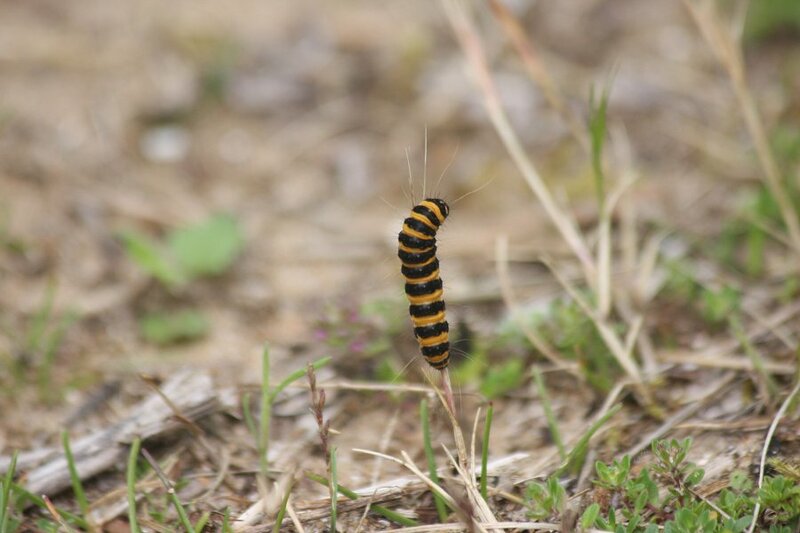 Cinnabar moth caterpillar. The moth has stunning red patterns on black wings, and bright red secondary wings. The caterpillar is the bright yellow and black seen here. These feed on the highly toxic ragwort, making the caterpillars and moths toxic, and the bright colours serve as a warning. These would be toxic to the reptiles that live here. 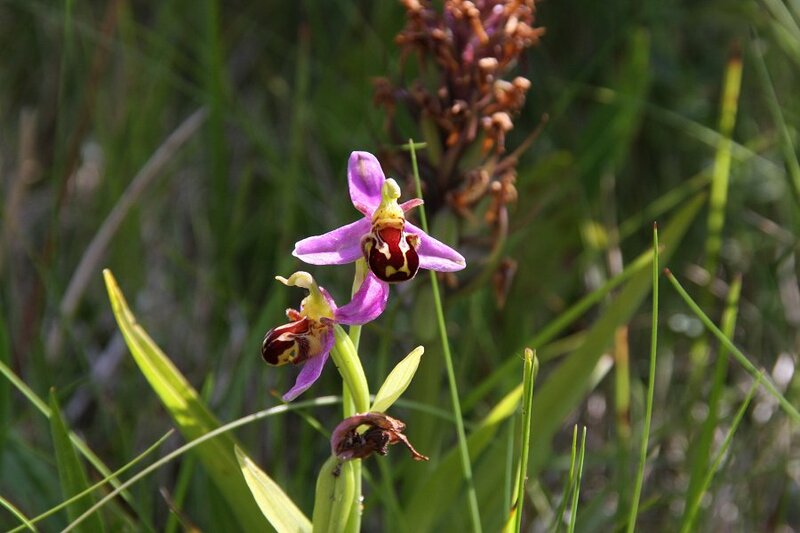 Bee orchid, a flower that looks rather convincingly like a colourful insect. The effect is convincing enough that bees think they have seen another bee, and move in to mate, and in the processs of trying, they pollinate the flower. The process of evolutionary changes that must have happened to enable this behavioural hijacking, is quite staggering. Which beneficial changes took place in what order, in order to be naturally selected for propagation? 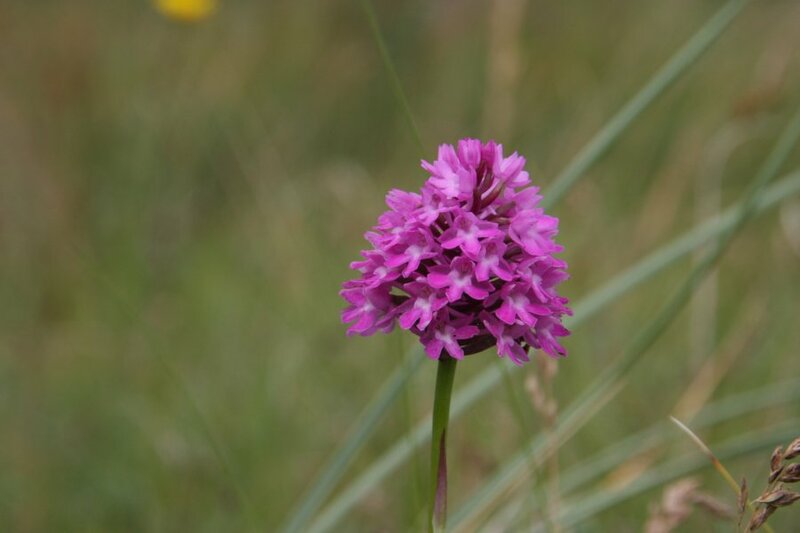 The plant in the background appears to be a rather wilted helleborine. 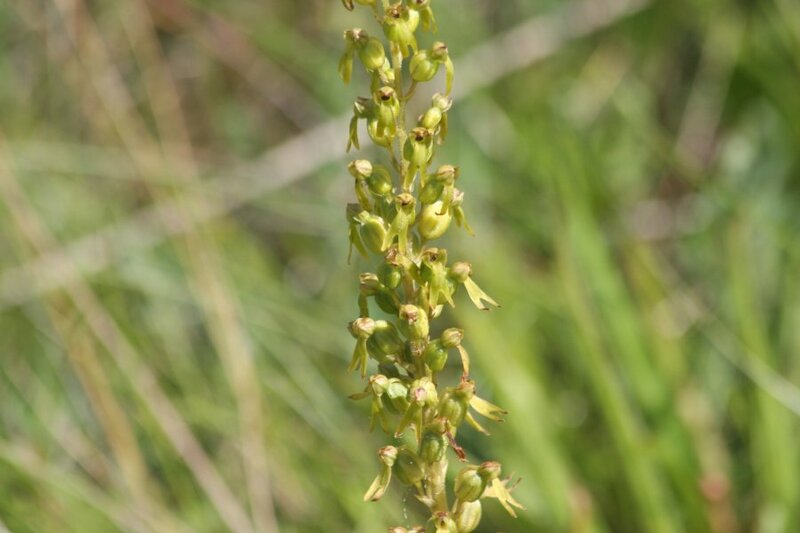 Common twayblade, green orchid flowers on a green stem against a green background. Looks more like an orchid that has lost all its petals. 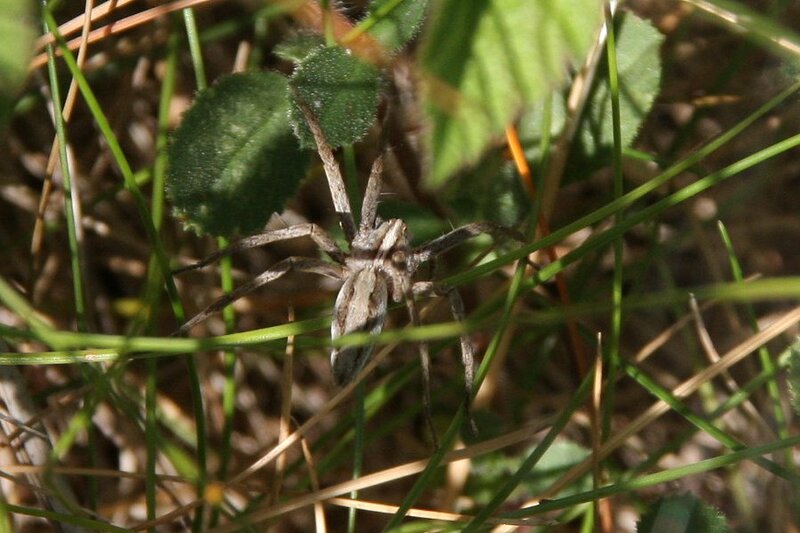 Female nursery web spider. 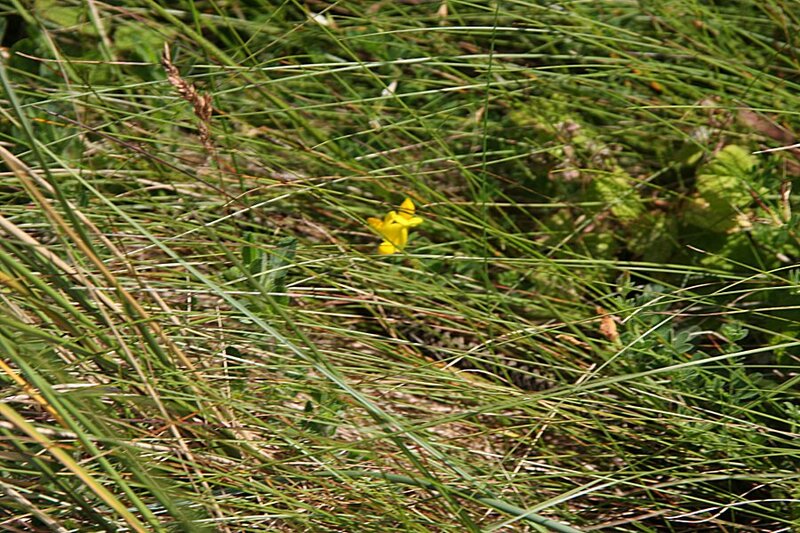 These are an ambush predator, and do not use a web for hunting. Her nursery web. 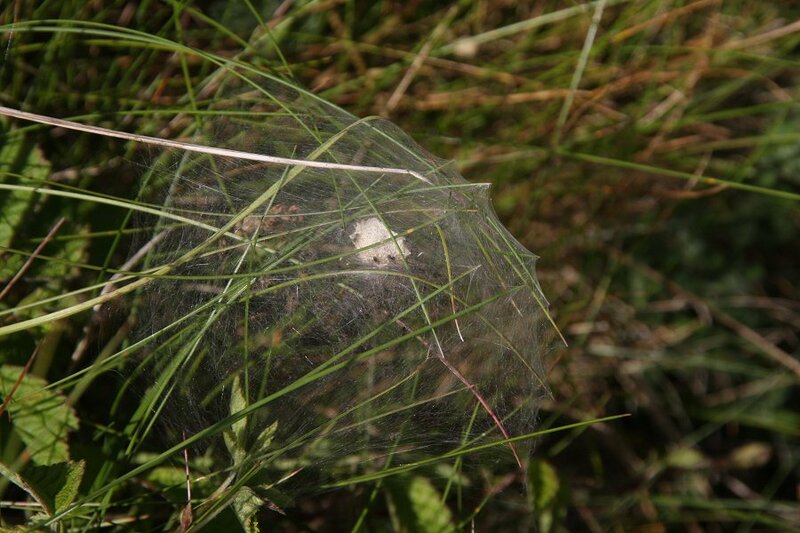 The egg sac is visible in the middle of the tent, and if you look carefully, you can see the spiderlings. The mother, unusually for a spider, guards her offspring until they have shed once, and are ready to live on their own. 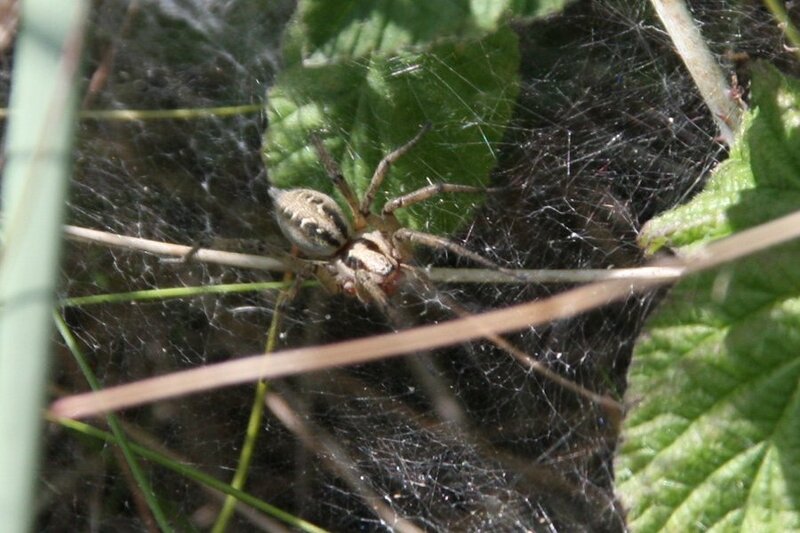 Female labyrinth spider. These are hardly ever seen, but their funnel webs are often visible in brickwork and fences, where they have tunnels with multiple escape routes and entrances. 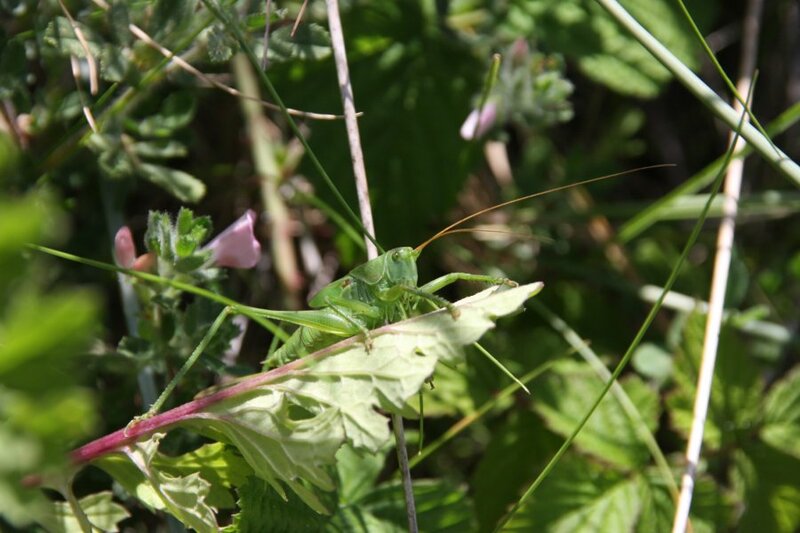 Katydid, specifically a female great green bush-cricket nymph. She is about 6.5 cm from her head to the tip of her ovipositor. As an adult, her wings will be longer than her tail, and she will be able to fly. 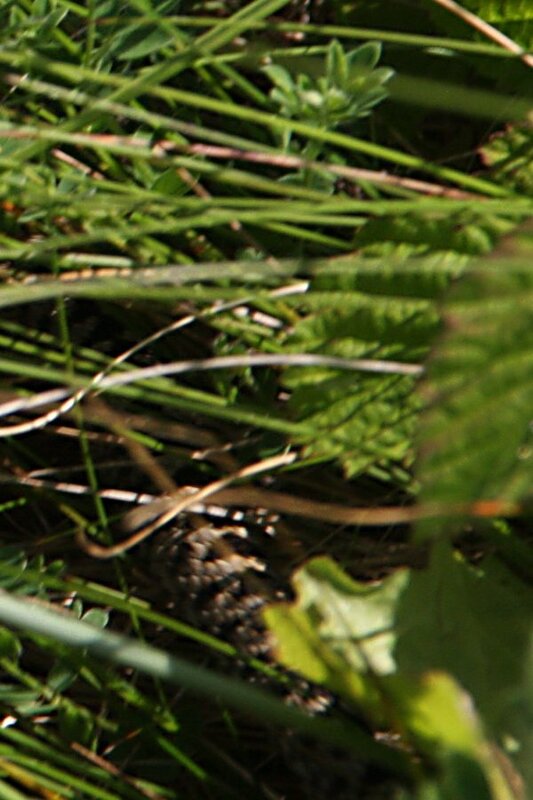 A male adder resting invisibly next to the path. We had been hoping to see one all day, but this was as good as it got. He sped away as soon as he felt a footstep near him - their normal response. Biting tends to be reserved for cases where they are stood on or grabbed, and are unable to escape. The teeth are usually unable to penetrate proper shoes. These are our only venomous snake, but their venom is relatively poor. Although it is said to be rather more painful and long lasting than a bee sting, and a hospital visit is the best advice if bitten, the usual treatment is simply observation, with a possibility of antihistamines if you have a severe allergic reaction. Antivenoms have been developed for the cases where they are needed, since it is possible to have severe reactions, particularly in children. The venom has a more serious effect on dogs, who are also much more likely to get bitten. 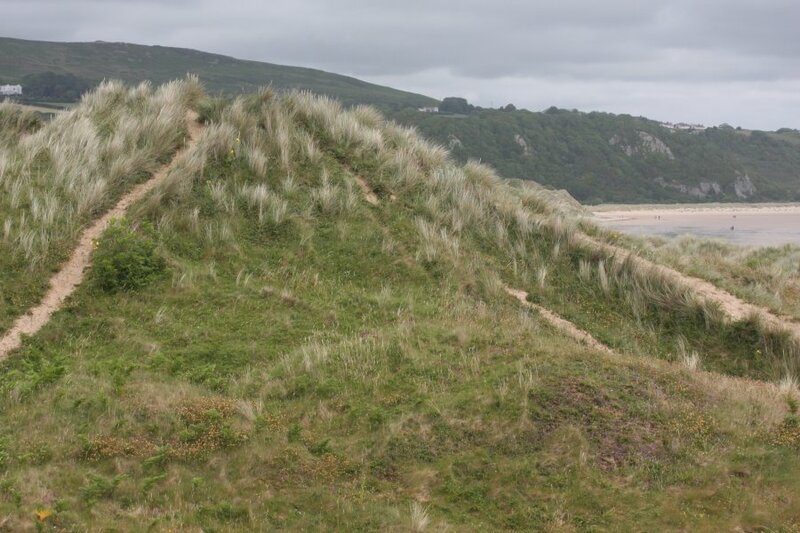 Dunes. We turned around and headed back for a guided excursion along the shoreline. 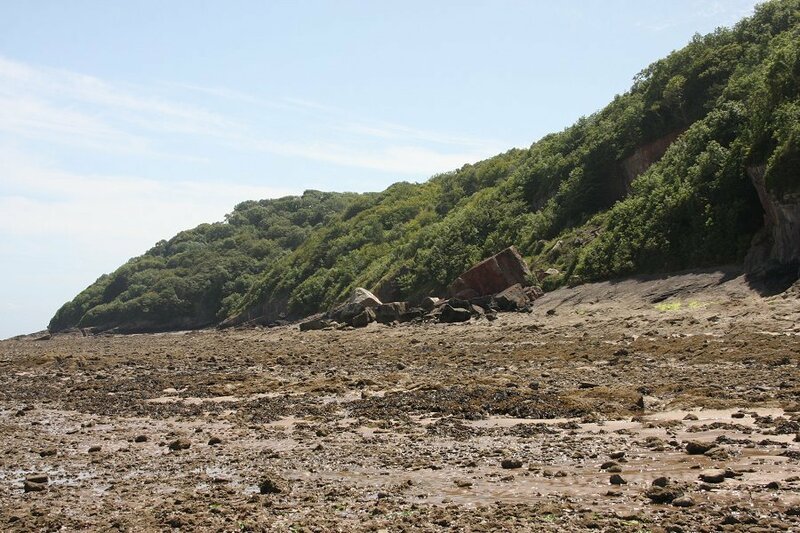 Oxwich Wood. 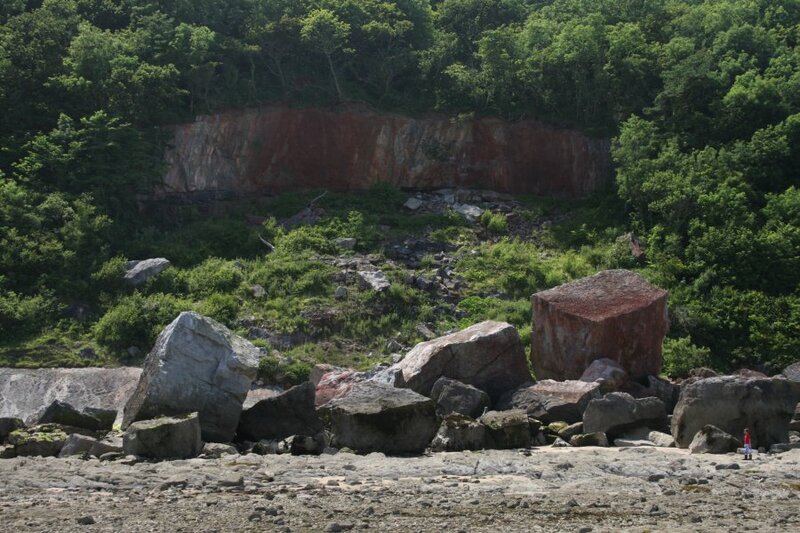 The immense rockfall has slid down from the ochre-stained cliffs above. See the people for scale. Rockfall and the scree slope it slid down. 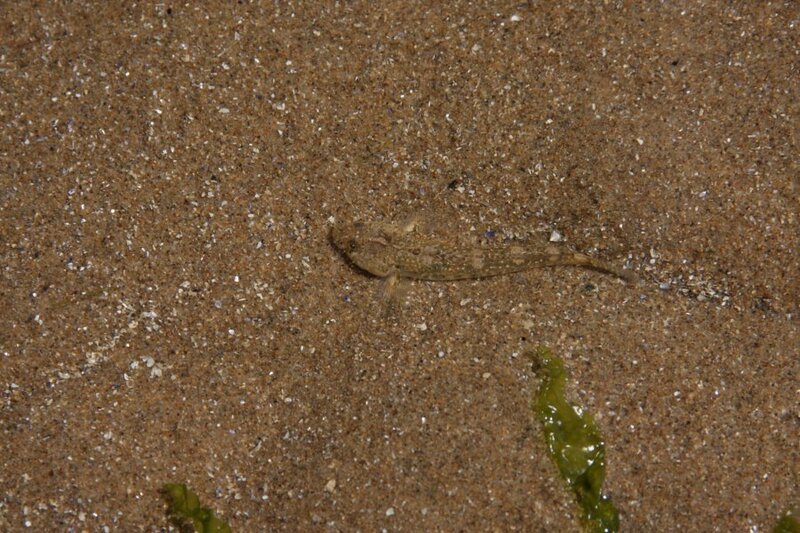 Common goby, I think. 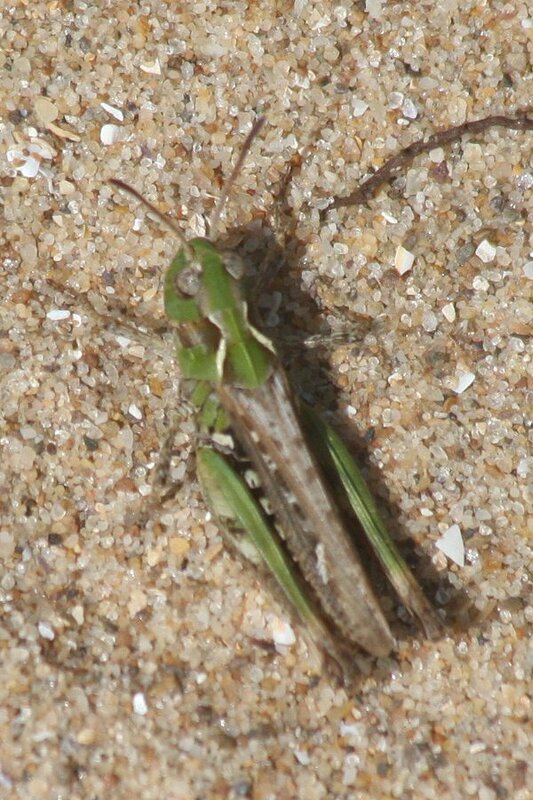 Almost invisible against the sand. 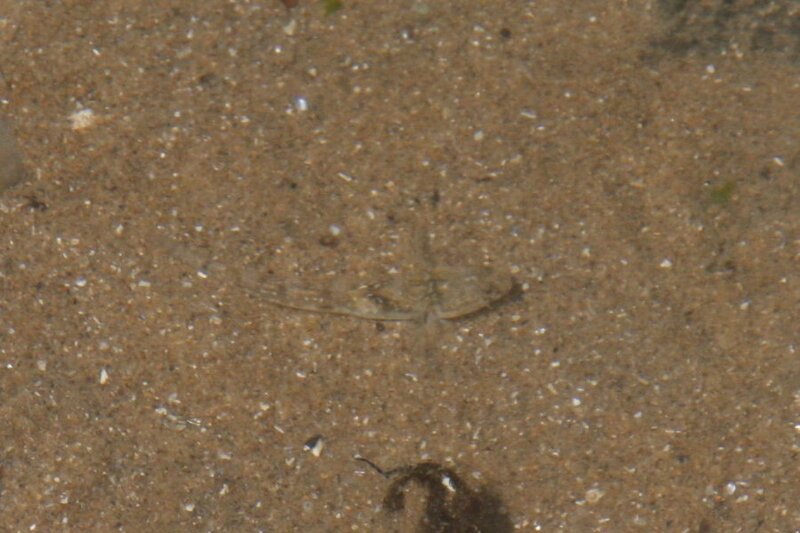 Tiny shore crab, also almost invisible against the sand. Slightly to the left of centre, two black spots and a white stripe on its back, claws facing the camera. 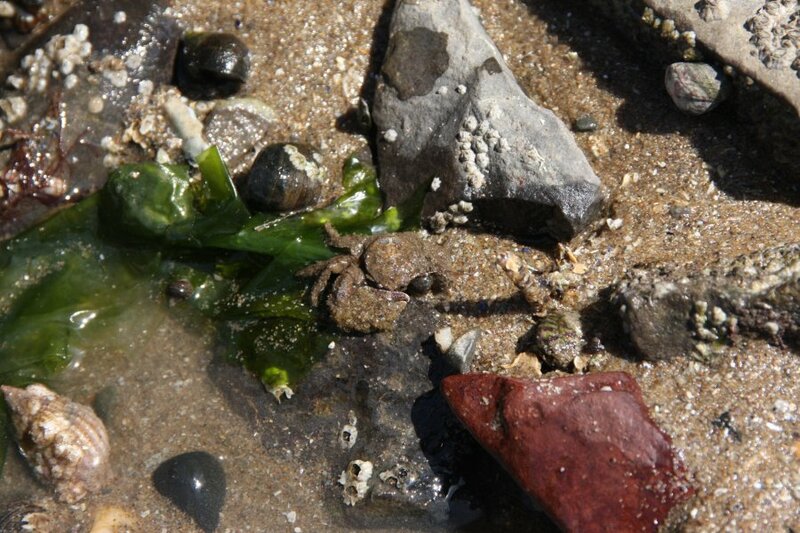 Moderately-sized shore crab, scuttling sideways. 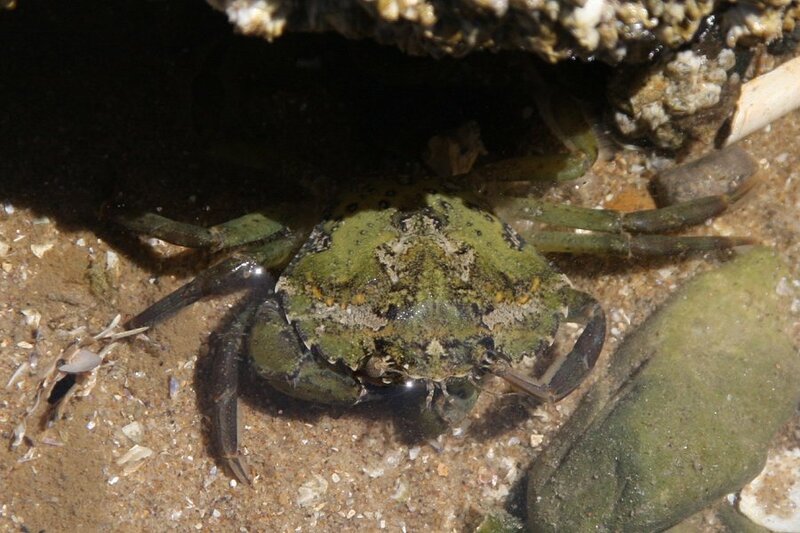 Adult shore crab, cleaning its eye with a claw. The shore crabs can be identified by the three points on the shell between the eyes, and five on either side. 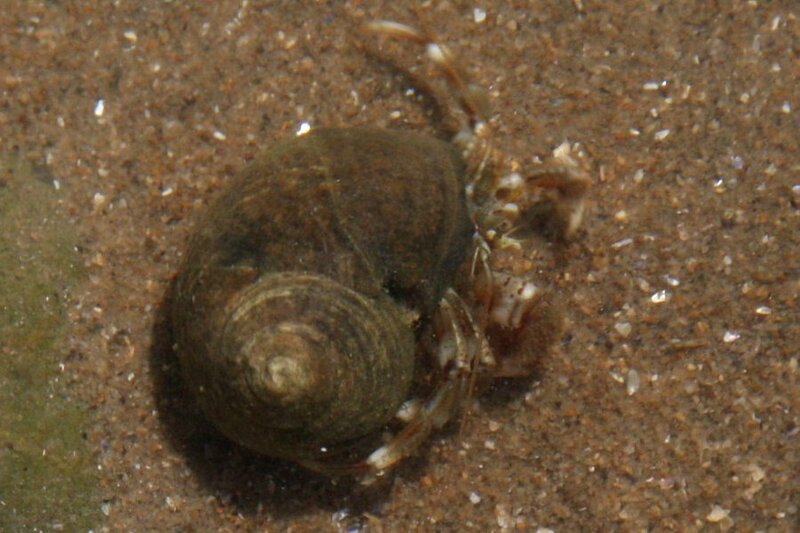 Common hermit crab, often with loads of them in a single pool. The shell may have come from anything, and might even be litter dropped by a human. 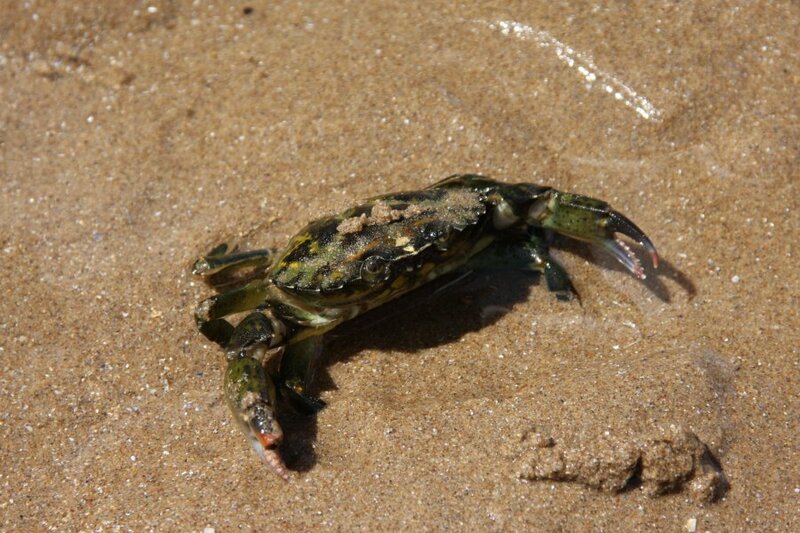 The crab's thin body is soft, so the shell is needed for protection. The crabs pick larger shells as they grow. 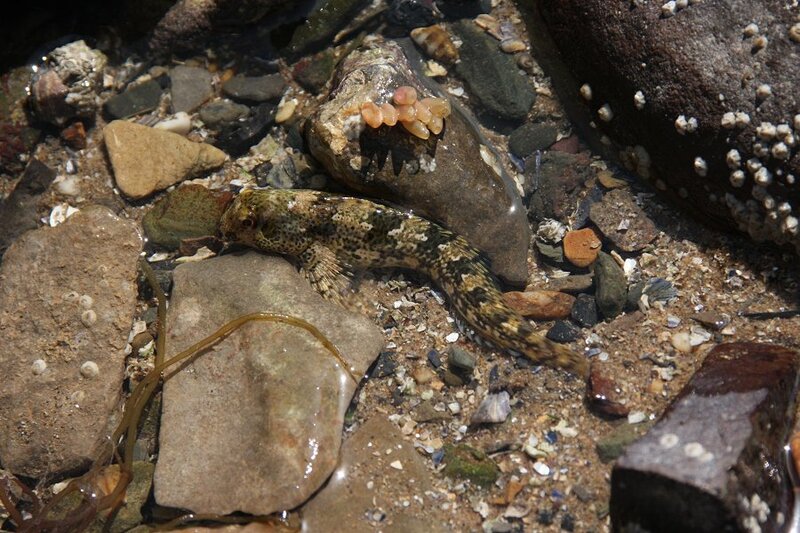 Common goby, more easy to identify this time. Shed skin (exuvia) of a shore crab. The large bulges are the gills. Shore crab in a defensive pose. Seconds later it shuffled itself under the sand and disappeared. 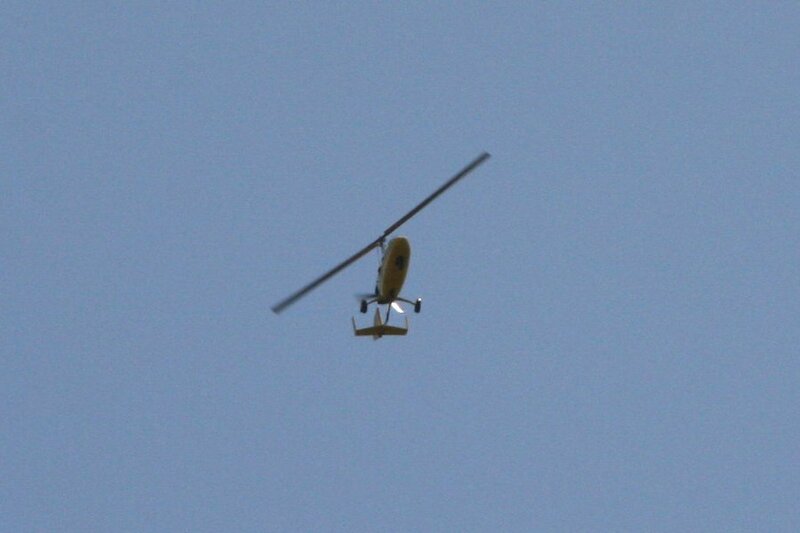 Autogyro (gyrocopter). The powered propeller can be seen at the back. The main propeller is unpowered, and turns only because of the airflow from below, caused by the forward motion. The rotating blade creates a lift effect. Weird craft that predates regular helicopters. 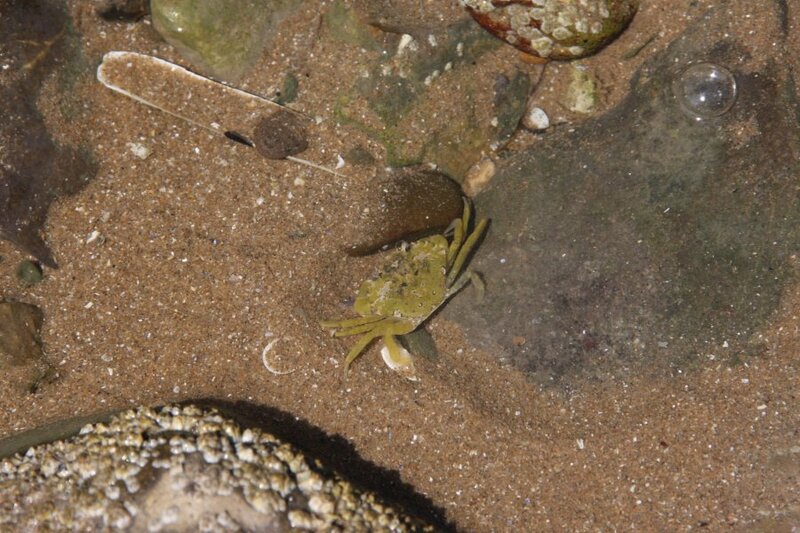 Broad-clawed porcelain crab. 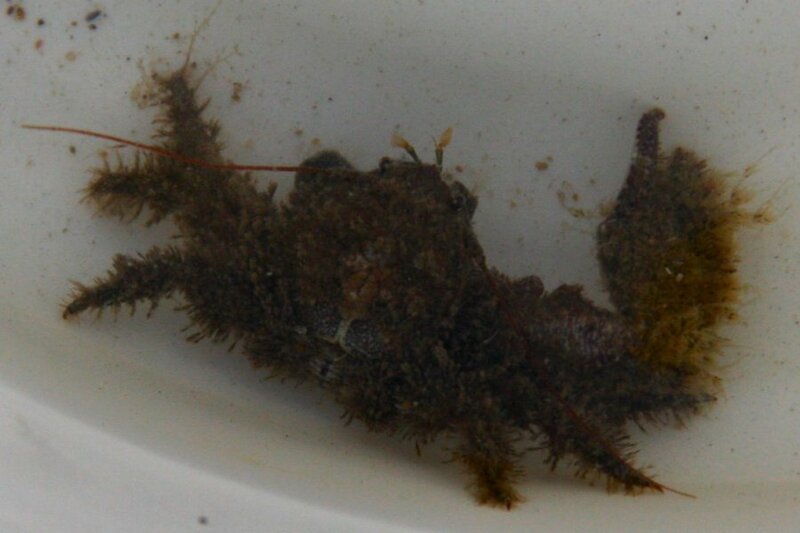 It is in the middle of the picture, with half its legs and one pincer on the seaweed. The seaweed is sea lettuce, which is an alternative to the red laver (used to make laverbread). It tastes like plastic with salt on it. 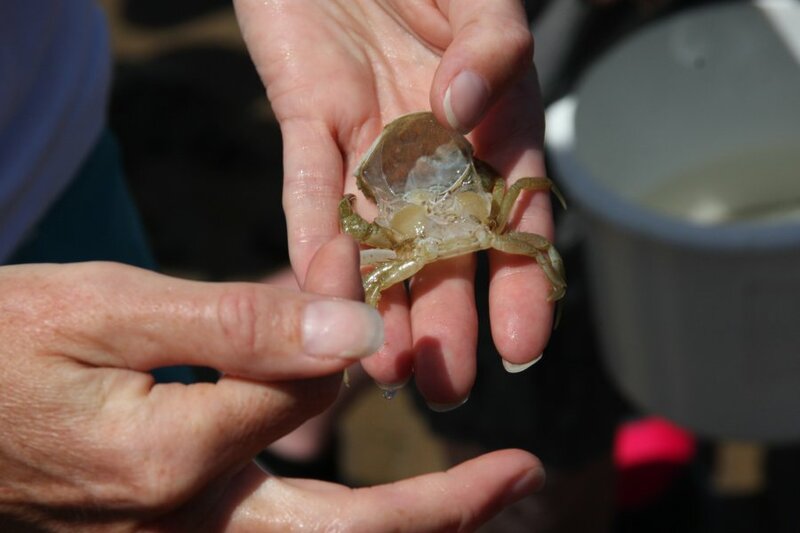 Porcelain crabs get their name because they readily shed claws to distract predators. This one had evidently done so recently. 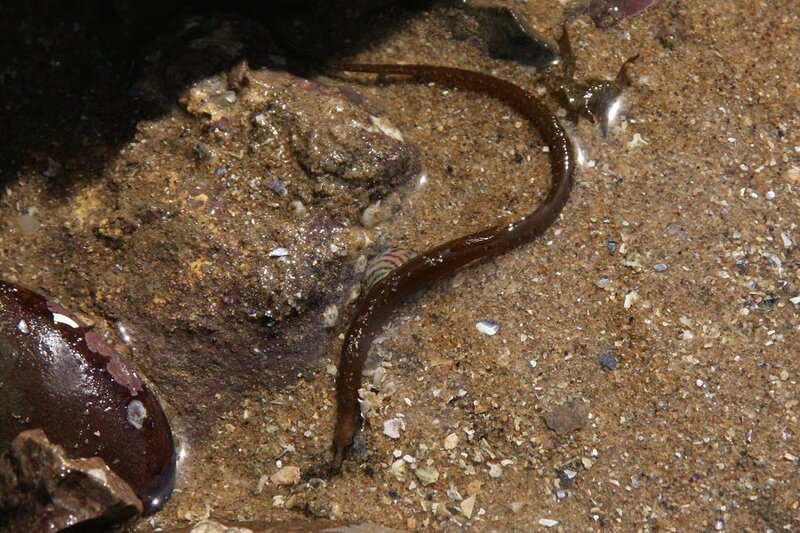 Snake pipefish, an elongated relative of the seahorse. 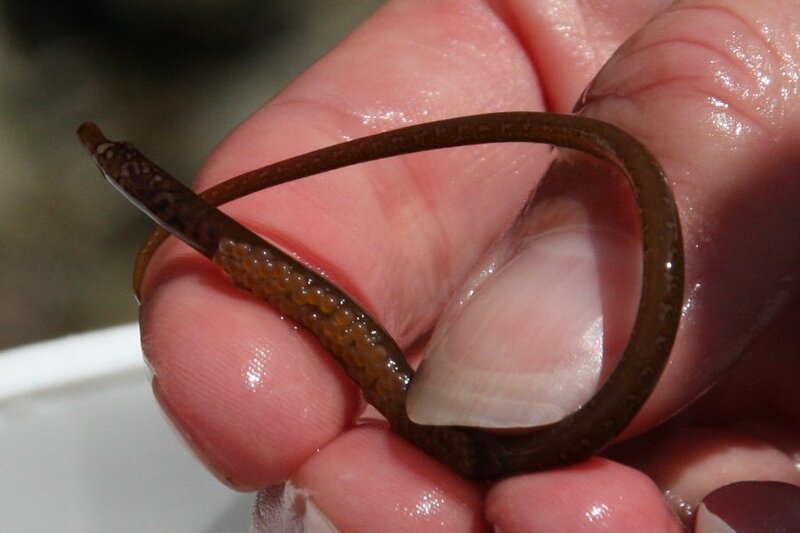 Roe (eggs) being carried by the pipefish. 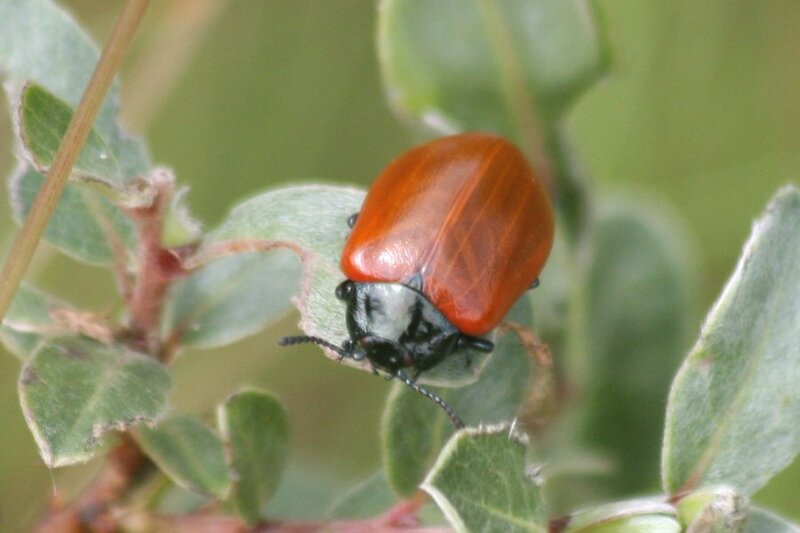 This is a male, carrying the eggs which were placed there by the female. 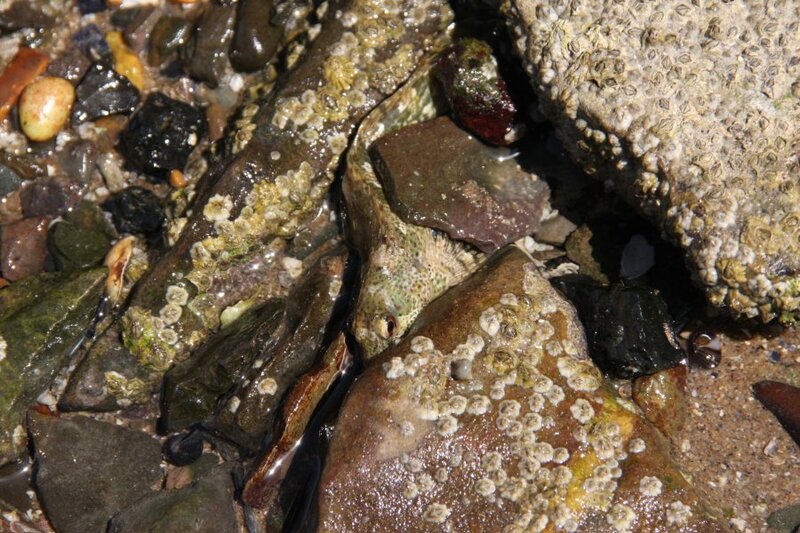 Wedged between the rocks is a common blenny (shanny). 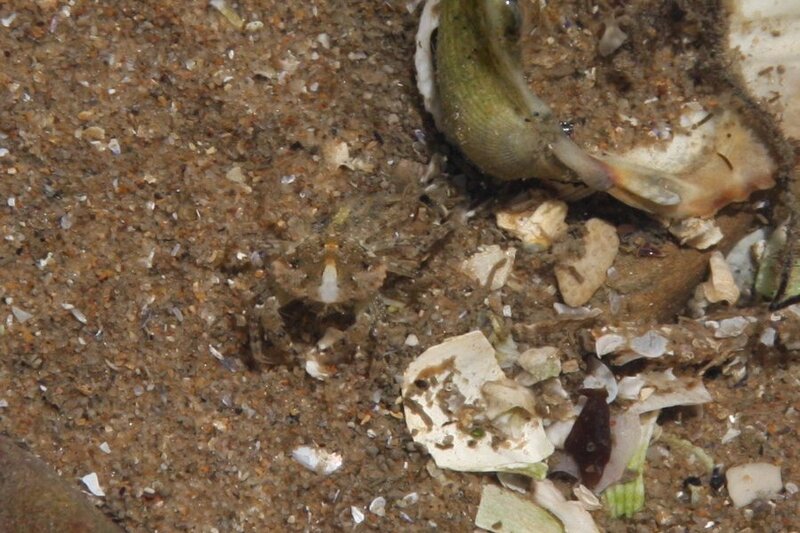 Common blenny (shanny) guarding some eggs. 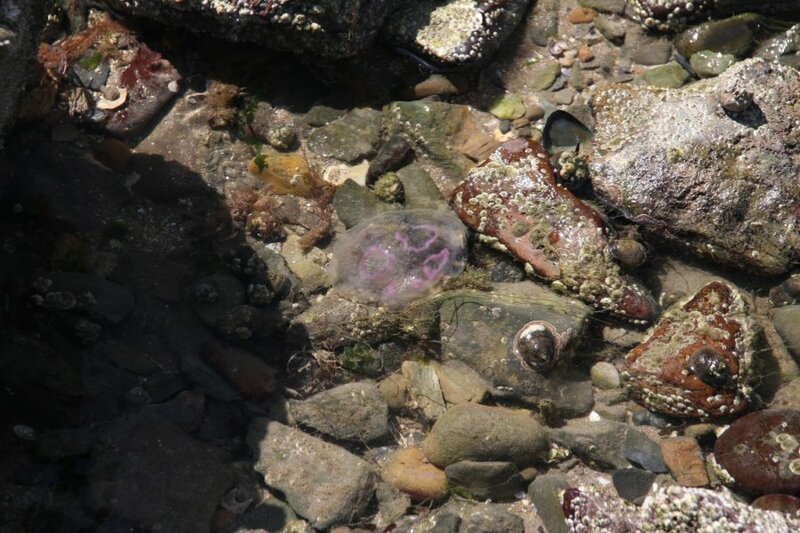 Moon jellyfish. 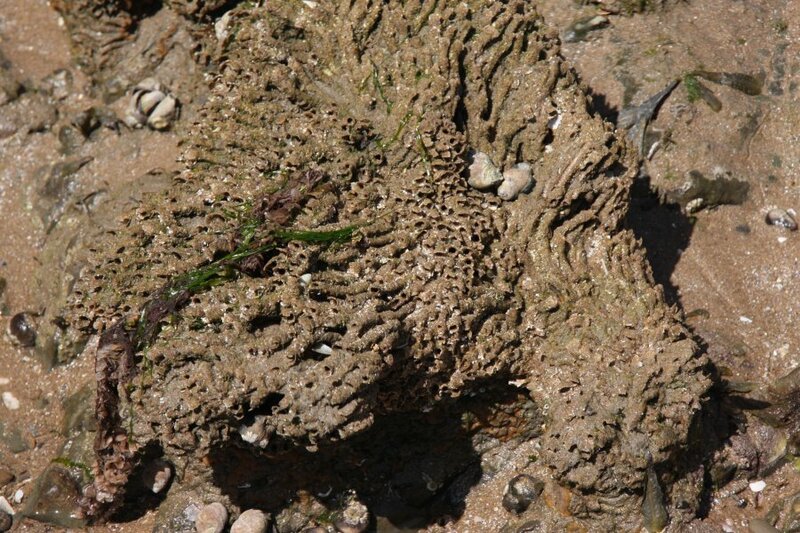 As drifters rather than swimmers, these are often washed onshore. This one was lucky enough to end up in a pool instead. It does not have a significant sting. 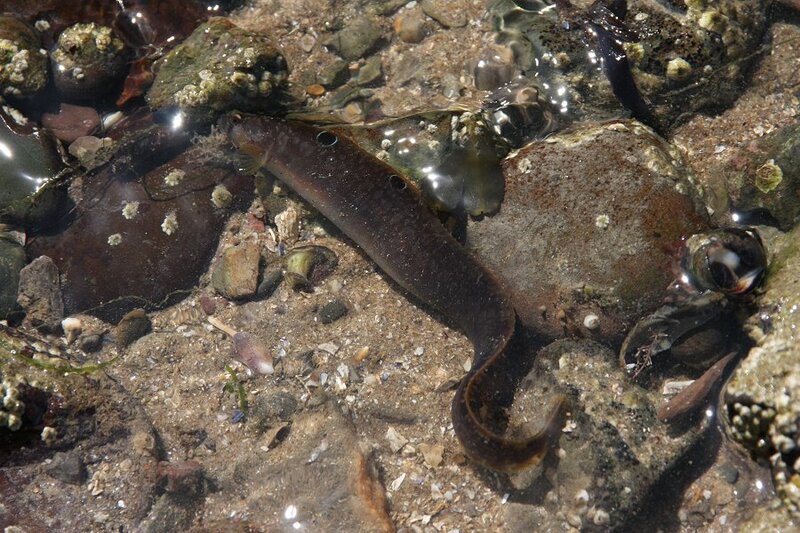 Butterfish (specifically the rock gunnel), with its false eye markings, and extremely slippery skin. If needed, these fish can survive out of water by breathing air.